Official images of the new Castagna Aznom concept car based on the Corvette Z06 have been released, presenting the image of an aggressively styled concept sports car which is firmly in the traditions of the revived carrozzeria. The Aznom was announced in March, and unveiled at the Top Marques show in Monaco during April. 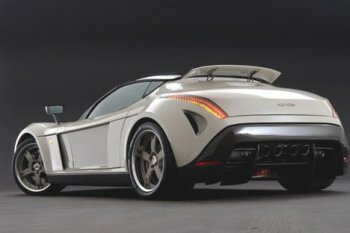 Carrozzeria Castagna is just one of a raft of famous Italian coachbuilding names that have been revived in recent years to cash in on the new boom for one-off or very limited-edition bespoke cars, although Castagna's comeback in the mid-1990s puts it slightly ahead of this burgeoning rejuvenation process. The atelier, which faded way in the 1950s after almost exactly a century of existence, was re-launched by Italian businessman Gioacchino Acampora in 1996 when he presented a controversially-styled Alfa 75-based concept car at the Geneva Salon. Since then the carrozzeria has become best known for its diverse range of Mini-based conversions, as well as several one-off sports cars, and last year's huge Imperial Landaulet concept which paid homage to the historic Isotta-Fraschini Tipo 8A which Castagna memorably re-bodied in the 1920s. 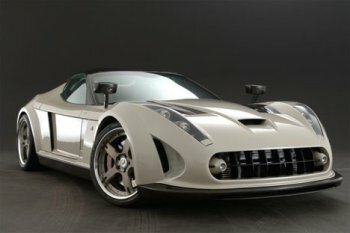 The Covette Z06 based Aznom is very much in the distinct style that Castagna has pursued over the last decade, however also embodies many traditional Corvette design features set forward by legendary General Motors designer Harley Earl in the 1950s. Perhaps the most identifiable Corvette styling element on the Aznom is the retro egg-crate grille which harks back to the original 1953 model. As on the classic 1958 Stingray Racer and the production Stingray model, the flanks of the Aznom are very straight and slab-sided, whereas the distinctive air-intakes placed on the corner of each fender link back to the organic and distinctive side scallops of the classic 1956 SR-2 Sebring Racer. The bonnet, with its sharp creases, also gives an indication to the Stingray. Traditional Castagna details include the use of LEDs in the rear lights which also rise in a narrow profile to provide symmetry both with the headlights and the car's overall form. Inside the racing treatment continues with the minimalist electronic instrument unit and the sat-nav system which uses 'Google Earth' to pinpoint the car's position at any point on a race track. The splitter, which kicks up high to form part of the overall line of the car, houses four horizontally-position tail pipes protruding through the centre section. Official images of the Castagna Aznom concept car based on the Corvette Z06 have been released presenting an aggressively styled concept sports car firmly in the traditions of the revived carrozzeria. Castagna say that the Corvette Z06's 7.0-litre aluminium V8 engine has been hiked by them from the American 'muscle' car's standard power output of just over 500 bhp, to a massive 750 bhp at 6,200 rpm, making this a fearsomely powerful sports car. With a dry sump, rear wheel drive, sequential fuel injection and traction control, maximum torque is a reported 980 Nm at 3,800 rpm, while top speed is a claimed 350 km/h, 0-100 km/h is reached in 3.4 seconds, and 0-260 km/h in 9.5 seconds. The Aznom sports car also has a number of features that have become an integral part of modern high-performance sports car design, such has the high level rear spoiler which raises away from the bodywork at speed, a system used by Mercedes to great effect on their 1950s 300 SLR racing cars, and recently used by the likes of Porsche on several production models over recent years. The Aznom also features a 'must-have' 3-section rear splitter, another prevailing design cue drawn from F1 cars of the current era. The splitter, which kicks up high to form part of the overall line of the car houses four horizontally-position tail pipes protruding through the centre section. The overall sense of purpose is reinforced by the dark 5-spoke, split-rim 20-inch wheels shod with Pirelli PZero tyres (285/30 at the front and 335/30 at the rear) which cover 356 mm cross-drilled discs 6-pot calipers at the front and 340 mm discs and 4-pot calipers at the rear. Continuing the technological thinking drawn the racing car world which has been incorporated into the Aznom's design, which is a 'track day' special, include major use of carbon fibre for the enveloping new body which is laid over the Z06's steel shell, with magnesium and aluminium structural components also used in the coachwork process to help reduce overall weight to 1400 kg. Further weight savings and aerodynamic efficiency come from a composite-material 'flat bottom', while there are smaller overall details such as the carbon-shelled rear view mirrors which are mounted on vertical posts, very reminiscent of a Formula 1 car, or a sports-prototype from the 1970s and 1980s, and the two sports car racer-style ribbed bonnet air exits. 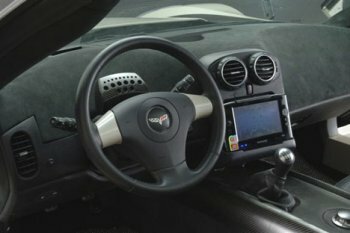 Inside this racing car treatment continues with the minimalist electronic instrument unit and the centre-console positioned sat-nav system which uses 'Google Earth' to pinpoint the car's location at any point on a race track.